Disney has released several trailers for the big upcoming 2019 releases. Dumbo has several, as does Captain Marvel. Avengers: Endgame got its second last week at the Super Bowl. Even The Lion King has had a full-length trailer since Thanksgiving. But for some reason, the House of Mouse hasn’t put out a full-length Aladdin trailer, despite it coming out in May. 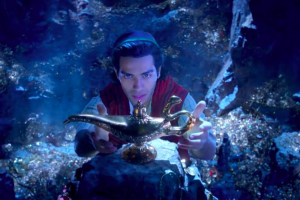 Fans were wondering why, until this weekend, when the new Aladdin trailer finally revealed the Genie, and fans were immediately horrified. There have been questions about the live-action Aladdin‘s production design even before the first teaser without the Genie dropped last fall. Rumors of extras in brown-face had fans concerned about the direction of the remake of Disney’s 1992 film, which at the time was full of disappointing stereotyping about the Middle East. When the first images dropped at the end of the year, everyone couldn’t help but note the state of Will Smith, who is taking over the iconic role of the Genie from the late Robin Williams. In the original movie, the Genie was blue, In the photos, Will Smith was not. The production swore this was due to the CGI not being ready and that Will Smith would indeed be blue come the final product. Twitter screamed in horror in unison. So far the films remade have been lucky. Cinderella made the stepmother and stepsisters look like something out of RuPaul’s Drag Race in translating the over-the-top looks to the screen. Despite the concerns about a motion capture Beast, Dan Stevens’ romantic foil to Emma Watson’s Beauty came out fine in Beauty & The Beast. (Cogsworth was a little terrifying, but he’s just a clock sidekick.) And the animals in both Dumbo and The Lion King look fine so far. But the Genie doesn’t seem to have been so lucky. For the CGI to fail, and fall hard in this manner, in a year where the company has three live-action remakes arriving in a five month span, is a hiccup no one saw coming. But perhaps it was just the inevitable coming to pass, but the good news is, the studio has time to course correct. After all, the film doesn’t arrive for a few months yet. There’s still time to make adjustments in how the Genie looks. Aladdin arrives in theaters on May 24, 2019. « Is surgery the only cure for my eye wrinkles?